For six decades, NASA has led the peaceful exploration of space, making discoveries about our planet, our solar system, and our universe. 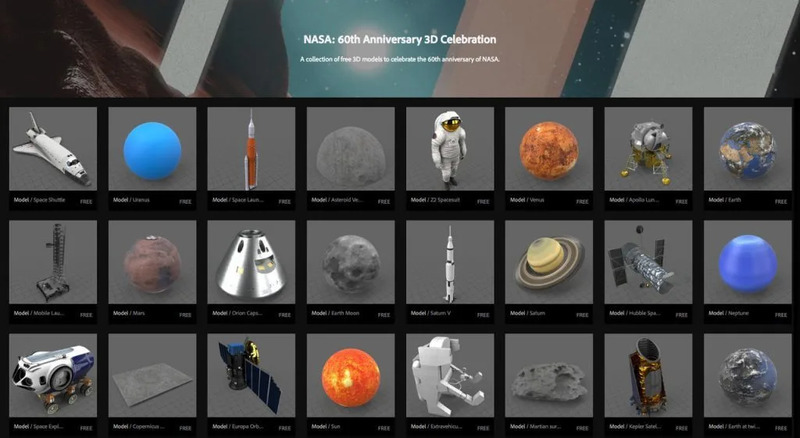 To celebrate this momentous anniversary and the release of Adobe Dimension 2.1, Adobe challenged artists to imagine the history or future of human exploration in space in the Adobe Dimension – From the Moon to Mars Challenge. Artists were called on to tell the stories of past and future space missions using free 3D assets from the Adobe 3D Stock “NASA: 60th Anniversary 3D Celebration” gallery and Adobe Dimension to compose and render a space-based scene following the challenge theme: From the Moon to Mars—Apollo 50th Anniversary. Special guest judge former NASA astronaut Nicole Stott, a veteran of two missions to the International Space Station and the astronaut who painted the first watercolor in space, judged the submissions along with the Adobe Dimension team and challenge host Randall Mackey. We’d like to thank Adobe, HP, Wacom, NVIDIA, Pixologic and Allegorithmic who teamed up to provide an amazing lineup of prizes for the winners of the Adobe Dimension – From the Moon to Mars Challenge! Congratulations to all of the artists who took part in the challenge, and were among the first to put the new Adobe Dimension 2.1 release to the test. We’re very proud to present the winners and Honourable Mentions for the Adobe Dimension – From the Moon to Mars Challenge. Check out all of the entries for the Adobe Dimension: From the Moon to Mars Challenge.